Army scientist in the classroom! The Next Generation STEM Teaching Project (NGSTP) is an AEOP initiative geared towards increasing professional development opportunities for K-12 teachers. 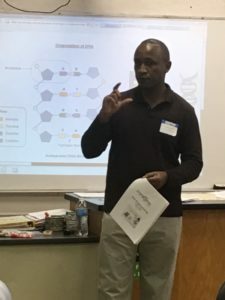 Recently, we had a chance to speak with Dr. Edwin Kamau, chief of molecular diagnostics and malaria vaccine development at the Walter Reed Army Institute of Research (WRAIR), and hear about his experience as a guest teacher at Toms River South High School in New Jersey with NGSTP. Why did you choose to participate in AEOP’s Next Gen STEM Teaching Project (NGSTP)? Dr. Kamau: I have been involved with AEOP’s Science and Engineering Apprentice Program (SEAP) since around 2006. When I was at the WRAIR the first time (between 2005-2012), I used to take summer students whenever I can. As a matter of fact, some of my most important scientific publications were developed with some of the students that came to me through the program. Also, I am involved in teaching at some capacity in other programs internationally because not only do I believe in science, I believe the next generation has great potential of being better scientists than we are and it is my generation’s responsibility to provide opportunities for them. Why should scientists consider participating in NGSTP? Dr. Kamau: It’s an extremely rewarding experience. My experience at Toms River South High School was memorable. The students are eager and willing to learn, they’re smart and they look up to you to guide them and make life choices. You inspire them but more important, they inspire you to be a better scientist and a mentor because they appreciate your work and believe in you. Can you describe your school visit? 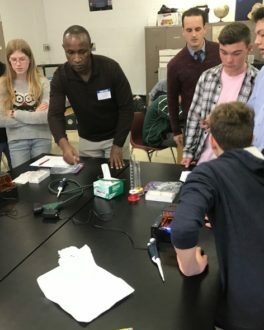 Dr. Kamau: As part of the NGSTP, I was paired with Mrs. Charlene Wallace of Toms River South High School in New Jersey to support DNA Sequencing and Analysis lessons. Mrs. Wallace and I communicated several times to go over her lesson plan. She extended an invitation for me to visit and help the students with the class lab activities. Before each class arrived, we would set up the lab by preparing samples and equipment. When the students settled in class, we would introduce them to the activities and ask them to proceed. As the gels were running, I had 20 minutes to briefly cover topics related to DNA fingerprinting. But most important, I had an opportunity to tell them more about the Military, the Army, WRAIR and the many opportunities that they should consider as they make career choices. I also met with faculty and other student organization groups that were interested in learning about my experiences as a military scientist. In total, I taught and met with over 100 students. It was an amazing experience and I was fascinated by the enthusiasm of the faculty, Mrs. Wallace and how well this program allowed me and other STEM practitioners to interact with the community. What do you think the students took away from this experience? Dr. Kamau: In addition to the science, the students were fascinated to learn about science in the military and the opportunities available. They were inspired by my life story and my work. What would you say to other professionals considering NGSTP? Dr. Kamau: It’s an experience like no other to share your profession with eager students. You might just change the world by inspiring that one child who will become a Nobel laureate or the world’s greatest science teacher. Science and Engineering Apprenticeship Program (SEAP) is a direct mentor-student relationship between Department of Defense scientists and talented high school seniors; an unparalleled opportunity. Visit our Program Volunteers page for a tool to find the best opportunity for you. The eCYBERMISSION Mini-Grant is intended to support teachers/program leaders as they implement eCYBERMISSION with their teams. Educators (formal and informal) of students in grades 6-9 are encouraged to apply. Special consideration is given to Title 1 schools and to those with underserved/ under-represented populations.